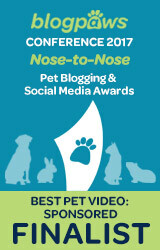 This post is sponsored by Only Natural Pet and the BlogPaws Professional Pet Blogger Network. I am being compensated for helping spread the word about the NEW Feline PowerFood, but Pawsitively Pets only shares information we feel is relevant to our readers. Only Natural Pet is not responsible for the content of this article. After adopting Callie the Cat about a month ago, there were a lot of things I needed to consider. One of the most important things I had to decide on was what kind of cat food I wanted to feed her. I knew I wanted to feed Callie plenty of wet food with some kibble. I don't know much about Callie's diet with her previous family, but she did come to me with a dry kibble cat food diet. So, I assume that's what she's used to eating. When Callie was almost out of her old cat food that she came to me with, I was browsing the grocery store shelves for a new food but wasn't super impressed at the selection they had there. Then, I had the chance to try the Only Natural Pet® Feline PowerFood™. Perfect timing! Only Natural Pet is a brand that I trust and feel safe using with my own pets, and I've used several of their products in the past. You might remember that Shiner tried the Canine PowerFood a few months ago. 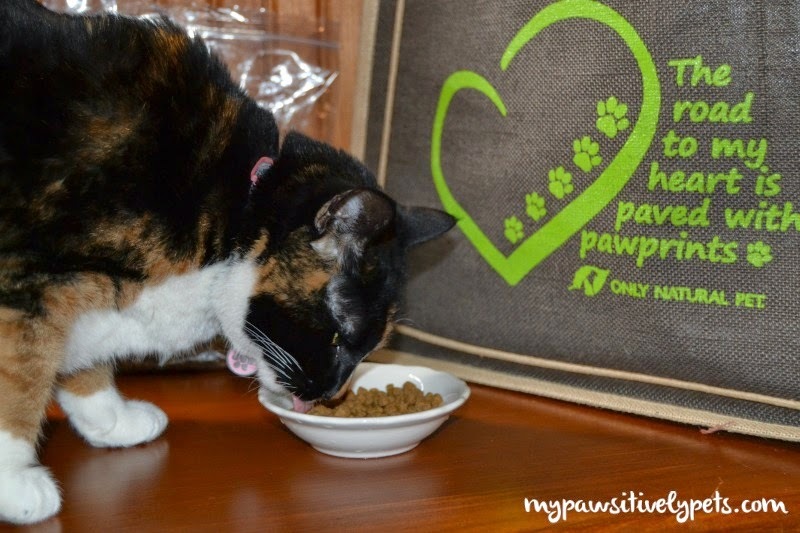 She did really well with the food and I was excited to also try the Feline PowerFood with Callie. We got to try this new Feline PowerFood before anyone else. It will be available for purchase in May and you can pre-order it here. It's grain, corn, wheat, oat, and soy free and made with gluten-free ingredients, making it an allergy-friendly cat food. 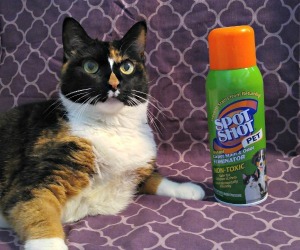 This is nice for cats with allergies. I don't think Callie has allergies, but I like grain-free diets anyways. The Only Natural Pet Feline PowerFood was formulated by a holistic veterinarian. This food is made in the USA - definitely important to us! It comes in two flavors - Fish & Fowl Dinner and Poultry Dinner. Callie tried the Poultry Dinner flavor. Available in wet food flavors, which Callie enjoys very much. Each piece of kibble is infused with PowerBoost™ - a raw freeze-dried blend of superfoods like green lipped mussels, sea cucumbers, probiotics, and pumpkin. Only Natural Pet's Feline PowerFood is full of protein, amino acids, and essential fatty acids and is formulated using the whole prey model of Callie's cat ancestors. It's rich with the nutritional benefits of fresh meat, wholesome fats, and balanced calories. Both kittens and cats can benefit from Feline PowerFood's grain-free, highly digestible diets. I am still learning about Callie and what her taste preferences are, so I wasn't too sure about what to expect from her. Callie tried the Poultry Dinner flavor cat food and she seems to love it. Every time I feed it to her she digs right in! One thing I have learned about her is that she's a messy eater. 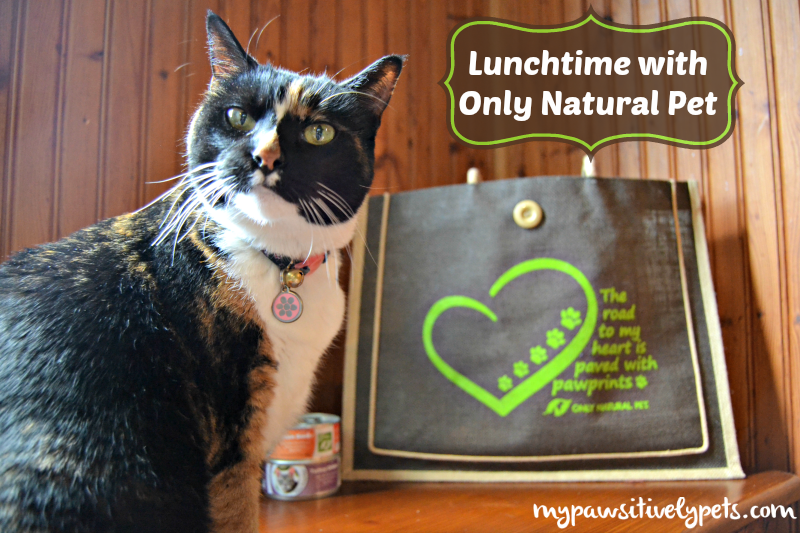 You can check her out enjoying lunchtime with her Only Natural Pet Feline PowerFood. The other day, I reached for Callie's bag of cat food to feed her and noticed that someone had tried to help themselves to it. I know it wasn't the dog, otherwise the food would be gone. So, I guess this is proof that she thoroughly enjoys her new cat food diet. I really don't have any gripes about this cat food other than I think I might like to purchase some more before May! Other than that, we give it 4 paws up and will be sure to send out a reminder when it becomes available. You can purchase the new Only Natural Pet Feline PowerFood exclusively on www.onlynaturalpet.com, www.pet360.com, and www.petfooddirect.com. It will be available for purchase in May! Or you can pre-order it here. 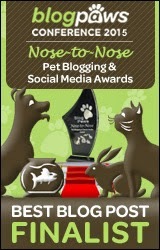 And if you want to stay up to date with Only Natural Pet, you can follow them on Facebook. 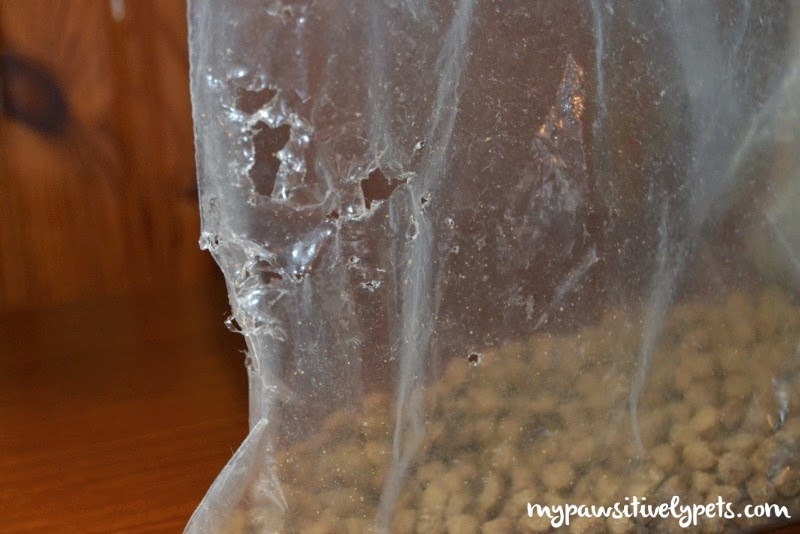 Does you cat eat dry kibble cat food? Do you think they would enjoy this new Feline PowerFood? Let us know in the comments! That was a great review! Sometimes we do the self-service thing too! There is nothing more satisfying then to know you've got healthy food that your pet enjoys eating. Great post, and may I say - Callie hit the "jackpot" when she became a part of your family. Sounds like she's adjusted well. Looks like she is into mischief! Bert would have eaten into the bag and eaten all the food too! Truffle and Brulee really liked the kibble. yeah, it was tasty, right? - Crepes. I loved my sample too! It looks like Callie is having some roblems swallowing the food. The think that food flies cos if you watched my video, a piece of food flew outta the dish. Yea, she eats weird I've noticed and have been watching her closely... I don't think she has trouble swallowing, but I wonder if she is even chewing it up sometimes. I try to listen and watch for crunching, but I never hear anything. I know it can be a sign of other stuff, so keeping an eye on it. We loved the PowerFood too!